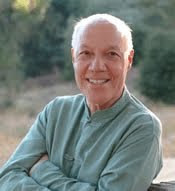 ... you wouldn't know he had one, from his Autobiography (which I just finished reading), other than that he mentions the presence of younger siblings and, in passing, his father's marriage. Pages containing the word "father" in the Autobiography: 127. Pages containing the word "mother": 1 (in reference to someone else's mother). Biographers seem to conclude that Mill's mother had little influence on him (e.g., Wilson in the Stanford Encyclopedia entry on Mill) -- but I don't think that follows at all. A Google search of Harriet Barrow Mill doesn't reveal much; she seems to be lost in the dust of time. Worried about the University of California? ... this graph says it all. 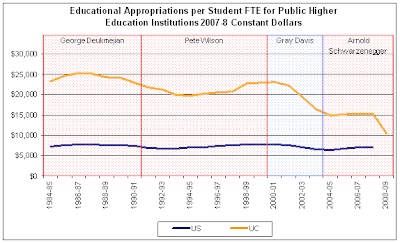 The blue line is below the yellow line because the blue line indicates the national average for all public higher education, including lower tier universities and two-year community colleges. Viewing the latest Lady Gaga video, with its ten product placements, I'm inspired by the thought: Why don't professors do product placements, too? There are many product placement opportunities for professors: We could display products like drinks or high fashion during classes and public lectures -- with all the respect we command from the high socio-economic status young adult demographic! We could mention products as examples in oral presentations and published articles. ("Suppose that a trolley is rolling out of control toward five people it will inevitably kill unless you push a heavy object over the tracks to stop it. The only available heavy object is a late-model Lexus RX10....") We could even link to them from our blogs. Now admittedly, the U.C. Riverside / Schwitzgebel brand is probably not realistically worth enough to command that kind of money for an advertisement, but maybe an eminent professor at Harvard or Princeton could do so -- especially given the free press that would no doubt accompany the first professorial facial tattoo advertisement. Peter Singer seems like a natural choice given his high visibility, and with his attitudes toward famine and charity, how could he refuse the offer? Back in the 1990s, Joe Cruz and I joked around about drawing up a "map of the analytic philosopher's brain" -- a kind of phrenological map, with the size of the labeled areas proportional to their importance to the discipline. Twin Earth would have a major lobe, while the meaning of life would have only a tiny nodule. (Twin Earth is a science fiction thought experiment about a planet just like Earth in all ways detectable to the inhabitants but with some chemical XYZ rather than H2O running in streams and clouds and faucets. The question is whether this would change the content or meaning of the inhabitants' thoughts and words.) Although Twin Earth discussion has died down a bit since the 1990s, I'd wager it still gets considerably more mentions in analytic philosophy articles than does the meaning of life. It occurs to me that the recent Chalmers/Bourget survey of the philosophical community is a kind of map of the analytic philosophers' brain, too. With feedback from a fair number of beta testers (including me), they developed a list of thirty questions to send around to a huge chunk of the Anglophone philosophical community (including almost all faculty at major departments) -- questions they felt would provide a kind of sociological snapshot of the profession's views on a wide range of key issues. Below, then, are the thirty questions they selected. Notice that the meaning of life makes no appearance. But we do see questions about zombies, teletransporters, and runaway trolleys. That these were the questions chosen is as interesting a fact about the sociology of the profession, I think, as the particular distribution of the answers. ... is now in print at Philosophical Psychology. If explicit cognition about morality promotes moral behavior then one might expect ethics professors to behave particularly well. However, professional ethicists’ behavior has never been empirically studied. The present research examined the rates at which ethics books are missing from leading academic libraries, compared to other philosophy books similar in age and popularity. Study 1 found that relatively obscure, contemporary ethics books of the sort likely to be borrowed mainly by professors and advanced students of philosophy were actually about 50% more likely to be missing than non-ethics books. 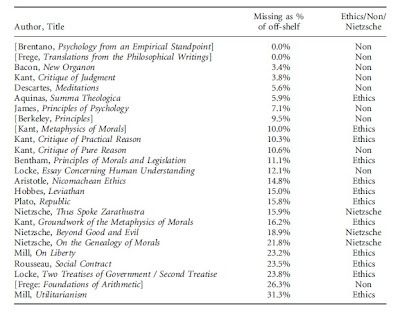 Study 2 found that classic (pre-1900) ethics books were about twice as likely to be missing. Does the Majority of Philosophers Think that the External World Exists? It turns out that 81.6% of philosophers are non-skeptical realists about the external world, thus confirming my hypothesis that there is greater philosophical consensus in favor of the Democratic party than about the existence of a mind-independent external world. The Schoolhouse Rock video "Elbow Room", celebrating the westward expansion of the U.S., got considerable TV airplay back in the 1970s when I was a kid. It looks very different to me now. What I find most chilling is the gleeful -- I'm sure unintentional -- parallel to the Nazi idea of "Lebensraum" (living room), used to justify German expansion. We were so fortunate to have an empty continent all to ourselves, don't you think?